Discussion in 'General Announcements' started by K3MRI, Mar 22, 2019. It's done, my first novel. It's not about Amateur Radio, per se, but Amateur Radio does save the day as one of the key heroes of the story both at the beginning of the story and, yes, at the end. I hope you enjoy it, if you do, I welcome reviews on Amazon or Goodreads but, please, no spoilers, especially the big one towards the end! 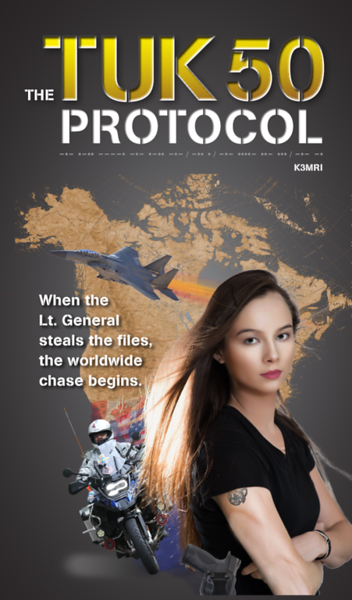 In this military, espionage, adventure novel, we discover the fragile nature of inter-agency intelligence and how a single event could trigger a nuclear Armageddon, still today. Fortunately, a pair of mismatched allies, Graham Lombard, a CSIS, has-been, intelligence analyst, and Masako Fujimori, an overdriven DIA field agent, will make it their duty to chase down the General over land, across oceans, in the air, and even the airwaves. In the end, it will come down to a choice, will one of the General’s own family members be prepared to stop him, even if it means killing him? Thanks to all those who have bought the paperback version. For those who were waiting for the Kindle version, here it is!! Added to my Kindle reading list now! Will post a review when done. Nervously awaiting your feedback. Hope you enjoy! Great front-cover but this Abebooks listing for the softcover can't be the one to encourage sales. £76 is $99, just now on currency converters.